fresh fettuccine in light garden tomato and shiitake mushroom sauce with pan seared scallops, originally uploaded by aarn! +18th September, 2008+. made some pasta dough with 1-lb of flour, 3 eggs, and a splash of water, tossed it in the refrigerator for 15-minutes, and then rolled out thin and cut into fettuccine with the hand crank pasta maker. made a nice light sauce (with the help of nic and trisha) made from shallots sauteed in olive oil, with fresh shiitake mushrooms, and sliced green olives, doused with sherry on medium heat, and fresh garden tomatoes (put in the pan and sauteed for a minute or two before serving). 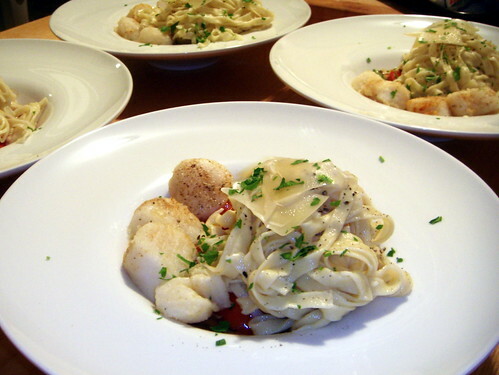 right about when the pasta went into the water and the tomatoes onto the stove, some small scallops from the co-op were pan seared after being coated in flour, pepper and salt, and stuck in the freezer for a minute. the pasta was coated in olive oil and some salt and then served in a ball on top of the sauce, with the scallops on the side, and topped with some large shavings of parmesan, and some parsley picked from the garden.